Between May and September of 1787, the 55 delegates of the U.S. Constitutional Convention gathered at Philadelphia’s Old State House (now known as Independence Hall) to debate and ratify the U.S. Constitution. Today, a short walk through the grassy mall extending north from Independence Hall takes visitors past the Liberty Bell, the site of the house where Presidents George Washington and John Adams once lived, and the grave of Benjamin Franklin, to arrive at the National Constitution Center, a sprawling museum established by Congress to “disseminate information about the United States Constitution on a nonpartisan basis” and open to the public since July 4, 2003. In 2014 the National Constitution Center, under the leadership of its new director, legal scholar Jeffrey Rosen, began a multiyear partnership with the John Templeton Foundation to expand its work in significant ways. The multi-prong “Coalition of Freedom” project, funded by the Foundation, encompassed museum exhibits, public events, student contests, and the creation of an innovative new tool that allows anyone to explore the origins, and multiple interpretations of, the Constitution. The Coalition of Freedom’s flagship product is the Interactive Constitution, a website and mobile app providing clause-by-clause commentary on this defining document. Anyone who even casually follows present-day politics, from Congressional debates to Supreme Court nominations, might be forgiven for concluding that U.S. constitutional interpretation is a minefield of mutually exclusive, intractable opinions, and unbridgeable intellectual chasms. But the Interactive Constitution manages to embrace the multitude of voices. For all 80 clauses of the Constitution, scholars with specialized expertise were selected with input and guidance from the project’s co-sponsors, the progressive American Constitution Society and the conservative Federalist Society. For each clause, a pair of scholars contributed to the online resource in two ways. First, they produced a jointly authored essay which describes the interpretive issues on which they agree concerning the clause. Second, each scholar produced an essay which describes and defends the points of interpretation on which they disagree concerning the clause. In addition to the clause-by-clause interpretation, the Interactive Constitution also features tools that allow users to trace the origins of the key ideas found in the Constitution, as well as how those ideas have spread around the world. One section charts how particular phrases originated in colonial documents and individual state constitutions. Another features a clickable world map for exploring which other countries have come to share the specific freedoms guaranteed in the Bill of Rights. Since its launch, the Interactive Constitution app has been downloaded more than 15 million times and has been utilized in thousands of classrooms. It has proven so successful as an instructional tool that the College Board is now working to include the Interactive Constitution in the curriculum for the Advanced Placement History and Government exams taken by hundreds of thousands of students every year. Dr. Jack Templeton, who led the John Templeton Foundation from 1995 until his death in 2015, worked closely with Rosen and his colleagues to set the early vision for the Coalition of Freedom. Rosen credits Templeton with the inspiration for one of the project’s more unique elements — a student playwriting contest. “Jack Templeton loved the quotation from Benjamin Franklin when Mrs. Powell asked him, ‘What have you wrought?’ and he replied, ‘A republic, Madam, if you can keep it.’ Jack’s question was: ‘What did Mrs. Powell say next?’ that became the prompt for the play,” Rosen says. 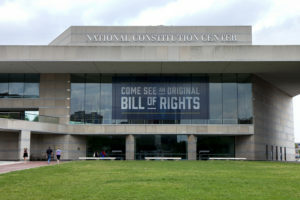 One winning play per year was chosen during the project’s three years and given a professional midsummer production at the National Constitution Center’s Bank of America Theater. In addition, a parallel essay contest honored a total of nine student essayists, while a school-wide curriculum contest gave a $100,000 grant to the school that developed the most innovative way to use the Interactive Constitution in the classroom. “We’re asking what James Madison would have thought of our current Congress, presidency, courts and media, and how we can resurrect Madisonian values of thoughtful deliberation and representative republicanism today,” Rosen reports. Explore the other offerings of The National Constitution Center, including public events, podcasts and more. Learn more about the Coalition of Freedom’s partner organizations—The Federalist Society and the American Constitution Society. Read Jeffrey Rosen’s academic and popular writings about the Constitution and U.S. Law.